ACI was set up over two decades ago when the now chairman Cliff Nye was inspired by the view out of the back of a run-down pub at Brancaster Staithe on the North Norfolk Coast and felt that more should be done to do that view justice. It was his first step into the hospitality world. That once shabby venue was transformed into the contemporary coastal inn The White Horse at Brancaster Staithe, which has now won the Good Hotel Guide Seaside Hotel of the year and Editor’s Choice award three years running. The success of The White Horse was followed by several other additions to the Group. This diversity is celebrated by ACI as it prides itself on individuality – no two places are the same, but what unites them are superb quality, stand out food, and a wide selection of well-kept beers, ales and wines from around the world (where relevant). The business also ensures that all staff offer a friendly, personal service, and one of the ways that it safeguards the best staff relationships with customers and guests is by expecting a lot from staff but giving just as much back. The management team want ACI establishments to be fun and friendly places to work; where people love their jobs, feel happy and supported, and can enjoy creating the best possible experiences for guests. As part of this approach ACI Has joined the Hospitality Action Employee Assistance Programme, which provides specialist, independent and confidential advice, support and assistance 24 hours a day, 365 days a year. It is thanks to this sort of scheme that ACI was shortlisted for the Caterer Awards 2016 in the Best Staff Rewards category. Not content with helping staff be the best they can be, ACI also supports the wider community, and in 2016, in celebration of its 20th birthday, it raised £21,000 for local charities. From sky dives, tough mudders, quizzes, biking challenges and swimathons the teams at all seven ACI establishments got involved. Thanks to this dedicated team of smiley, charming and knowledgeable staff ACI is able to look after its favourite people – its customers. Creating innovative and attractive promotions such as the ACI Loyalty Scheme is part and parcel of the ACI strategy, and as summer approaches in 2017 the business has a full diary of events to attract both regular and new visitors to its venues. With a natural focus on seafood given its location, The White Horse will host its 3rd Annual Champagne & Oyster Festival on 11th August – 4pm onwards watch the tide roll in at the bottom of the garden whilst enjoying a glass or two with Richard Loose’s Brancaster Staithe oysters served six ways and other culinary delights. The Jolly Sailors, Brancaster Staithe, is hosting its 8th Ale & Music Festival 16, 17 & 18 June – 30 local real ales & local bands in the garden marquee, it’s fun all the way here. The Kings Head at Letheringsett will host its 1st Midsummer Gin Festival 24 June 6pm in the garden marquee – Norfolk gins, workshops and fun happenings. It is clear that the food and beverage side of the business takes a top position on ACI’s agenda and the group makes a point of sourcing the freshest local ingredients from local farmers, fishermen and traders. The locality of suppliers is celebrated in many ways, so for example, at the Kings Head in Letheringsett, loaves of bread are baked in the kitchen every day with spelt flour from Norfolk’s only flour producing watermill based in Letheringsett itself. 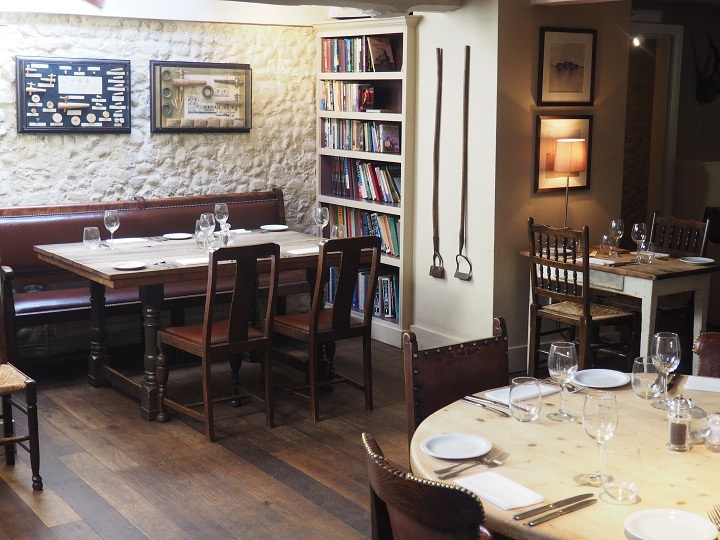 The Water Lane Bar and Restaurant in Bishop’s Stortford benefits from not only local producers but also the fresh fish and local mussels and oysters from Brancaster Staithe, as well as game from Norfolk. Hermitage Road Bar & Restaurant celebrates its food offering with a state-of-the-art open plan kitchen, where customers can witness the chef and team working their culinary magic. The Fox at Willian is also well known for its food and drink offering – it has been awarded two AA rosettes -The Fox has this year added eight smart and cosy guest rooms. Again, local sourcing is a priority but it also features real ales from ACI’s own Brancaster Brewery. The White Horse at Brancaster, which started the ACI journey, is renowned for its seafood, and has been listed in The Guardian as a Rural Gem and celebrated as an award winner by The Times as its Top Seafood Restaurant. The menu changes regularly and is created around the best seasonal pickings on offer by Head Chef Fran Hartshorne, who has been ‘home grown’ in The White Horse kitchen having worked there for 14 years, working her way up to Head Chef three years ago. “I feel the luckiest Head Chef on the Norfolk coast, creating in a kitchen that faces out across the stunning tidal marsh with a great variety of local fish and produce on our doorstep, it can’t get much better,” she commented. Looking back to the October 1996 when The White Horse was born, it is clear that the business has evolved with the times, embracing modern trends but always building on a foundation of tradition and quality. Cliff Nye has now been joined by his sons James and Howard at the helm, and the three Nye’s continue to grow ACI with the same sense of fun and pride as it started out with 20 years ago.